Over the last few years, we’ve received an increasing number of messages from teachers who show our music videos in their classes. They’ve come from educators all over the world who teach an amazing range of subjects to an amazing range of students: pre-k to graduate school, and home-schoolers to government flight instructors. It’s a truly moving experience to hear from these people, because normally we don’t expect the things we make to feed our souls after we’re done making them. We struggle and play and dance with our ideas, trying to wrestle them into existence as songs or videos, concerts or science projects, and when we’re lucky enough to coax one into being, that’s usually where the juicy part of the relationship ends. We send it off into the ether and hope that it nuzzles its way into people’s lives and delivers some warmth or catharsis or wonder. When a friend or a fan tells us they’ve enjoyed something, that’s an idea coming home to us. We’re always proud when one has gone out and met nice people and brightened a day or two. But when we hear from a teacher, that’s an idea coming home to say it’s been off volunteering and building a better world. Which feels pretty crazy, because we never taught it to do that. It just went out there and decided it wanted to be a do-gooder, without any encouragement from us. We’re super proud, but we’re also just kind of shocked. These teachers are heroes. Rock videos aren’t the first place anyone would look for educational material, so when one of ours shows up in a class, we can be sure the teacher has gone actively exploring unexpected territory for wonder and inspiration to bring back for their students. That’s noble. They’ve dedicated their lives to the betterment of others. We, on the other hand, spend our time playing guitar and shooting confetti at people and trying to weasel our way onto zero gravity planes. So we’re trying to step up our game here. We want to help. 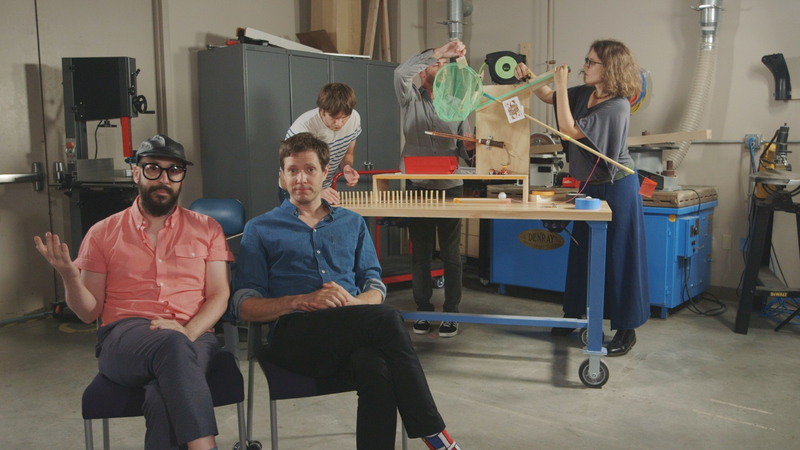 Working with AnnMarie Thomas’ incredible Playful Learning Lab and our longtime collaborator Geoff Shelton, we’re launching a new project called OK Go Sandbox today. It’s our attempt to support those heroic teachers with a collection of materials they can use in the classroom and while they’re planning lessons. So far, we’ve made a handful of videos that focus on concepts underlying three of our videos, and there are lesson plans and other teacher resources posted with them. You can check out everything at OK Go Sandbox. Teachers, we’re very excited to see how you use these materials, and anxious to learn from you what’s working, what’s not, and what you’d like from us in the future. We want this project to be ongoing, so please don’t hesitate to send us your comments and suggestions. Along with some saintly anonymous donors, Google and Morton Salt have both generously pitched in to bring this project to life. If you want to help us keep it alive, contact us at hello@okgosandbox.org. The official launch is today. AnnMarie and I are giving a presentation at the National Science Teacher’s Association, so if you’re a teacher and you’re in Atlanta, come check it out!